There are only so many times a parent can read Hop on Pop before they go a little batty. Thus, we are always searching for new reading material in our house. My toddler never does things in half measures: if he’s going to love something, he’ll love it wholly and completely. His favorite book? He’ll ask to read it seven times a day. And it must accompany him to bed. This lasts for about two weeks. And then he’s ready to move on to a new favorite obsession. We had a minor crisis the other day because he wasn’t quite done with the current crop of favorites and he didn’t understand why they had to go back to the library. “Well just buy them for me, mommy. I don’t want to send them back!” Oh, child. We need to have a little talk about money. He’s had a few stinker obsessions too. I’m kind of ready to be done with garbage trucks, for example. But dinosaurs? Never. Especially after my parents brought over the “How Do Dinosaurs...” series by Jane Yolen. They are awesome. The verses are great (we’re always on board with rhyming books) but the illustrations, especially of the poor, bewildered parents, are pure gold. does he give dirty looks? does he rip up his books? Fling a mug at the cat! From How Do Dinosaurs Say I’m Mad? At the conclusion of each book, the dino works out his problems or decides it really is time for bed. Although, between you and me, I like the ‘mad, stubborn, and mischievous' parts best. Reminds me of my own little stinker. and he picks up the mug. He gives a big hug. so he opens the door. Here is an interview with the author on how the series came to be. As for Emma, we have a few favorites. 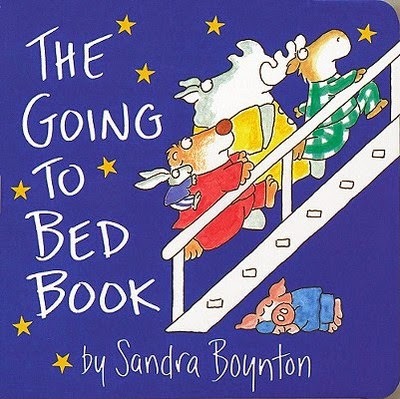 and the classic Going To Bed Book by the always-lovely Sandra Boynton. What are your favorites, My Dears? Any recommendations? We’d love some suggestions. I have 2 daughters and often change pronouns...the dinosaur books are all "he he he" which but one of the things i Like is changing the dino books to she as it doesn't change the rhythm of the story at all! Wait!!! How did I not know about the Going to Bed book?!?!?! Yay for new reading fodder. Our favorites - right now at least - are Goodnight Moon and Llama Llama Nighty Night. Although he's starting to like Curious George - so I have a feeling that's going to get a lot more play in the future!!! Exactly. we do the same thing with books: he to she is an easy one. Linds: We love the Sandra Boynton. Llama Llama is a new one, we’ll have to look that one up!